The Alka of Sinj Museum is dedicated to the annual knight’s tournament that takes place every August in the city of Sinj, Croatia. The tradition was inscribed on the UNESCO List of Intangible Heritage in 2010 and in 2015, on the 300th anniversary of the tournament, a museum dedicated to this spectacle was opened. Thanks to the opening of the museum, visitors now have the opportunity to engage with the tradition year-round, while those already familiar with the Alka of Sinj may gain new insight into the history and meaning behind the custom. 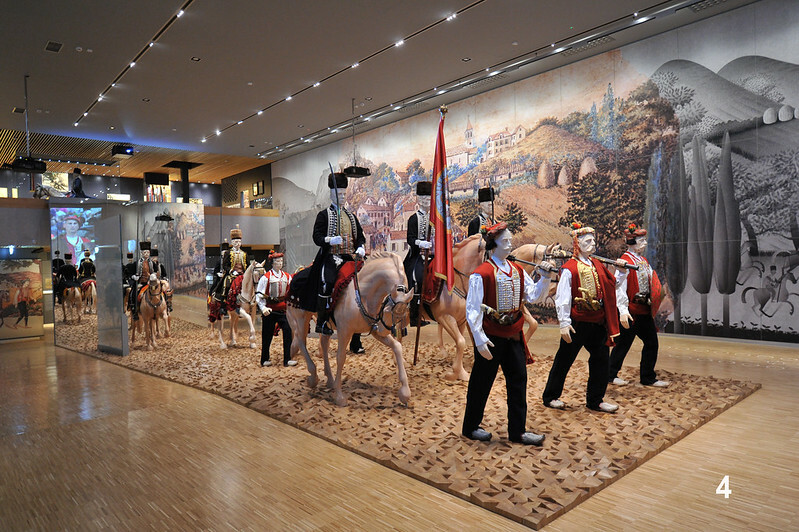 The museum was initiated and predominantly financed by the Alka Knights Society of Sinj, with additional funding coming from national and local governments. During the Alka of Sinj competition, the knights ride their horses at full gallop through the racecourse and aim lances at an iron ring hanging on a rope. The name of the ring is ‘alka’ – a word with a Turkish root, itself reflecting the intersection of Eastern and Western cultures present here. The contest each year marks a moment for the entire community to come together and partake in social gatherings and the preparation of the many aspects which contribute to the endurance of the custom. The museum provides detailed information about various elements of the tournament, its rules and history. The visitor has the opportunity to learn about the clothing worn and the equipment and weapons used through an interactive and multimedia exhibition space. The visitor can also browse a rich digital archive, including videos of the contests and processions from preceding years. “This project expands a one-day event into a sustainable model of awareness-raising and education for the whole year which is significant to the local community, the exclusive bearers of this tradition”, the jury said. The museum is intended for all age groups and there is a special focus on transmitting the tradition to children and young people. Educational workshops and lectures for local residents are provided for similar reasons, in order to protect and preserve the old traditions and crafts related to the Alka of Sinj, originating from Sinj and from other regions in Croatia, Europe and Asia. The jury highlighted this aspect, noting that “the museum has become a focal point of the activities and aims to keep intangible traditions alive through specific educational programmes, enhanced by an elaborate museum exhibition”. The work of the Museum of Alka of Sinj has made a tangible contribution to the development and improvement of the tourist infrastructure in the town of Sinj and to the preservation of this important heritage.